Die Lunæ, 25° Junii 1832. Giles v. Grover & Pollard, Judges Opinions further delivered seriatim. Marsh et al. v. Keating, Wr: Err: delivered. Doe v. Perratt & Burge, Judges to attend. Sir T. Slingsby's Estate Bill, Ld. Feversham sworn to give Evidence. Malcolm et al. v. Hotch-kis & Meiklejohn, Appellants Petition for a Remit, referred to Appeal Com ee. Broughton to enter into a Recogce on it. E. of Strathmore et Ux. v. Ewing. Mac Millan et al. v. Campbell et al. 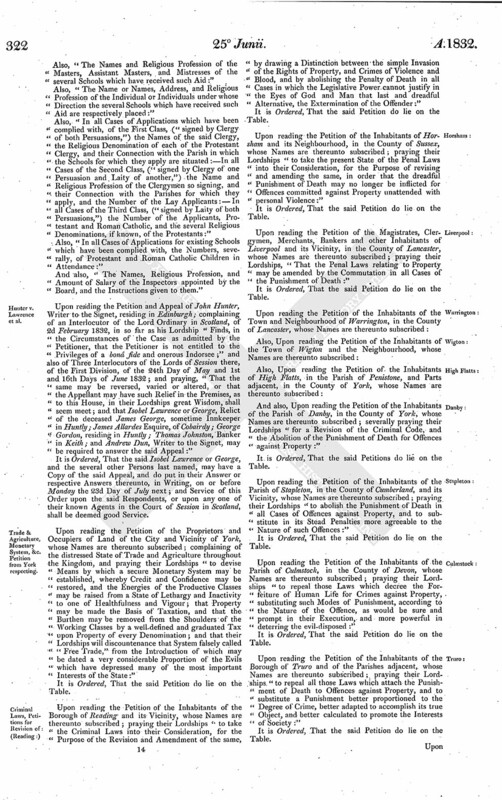 Education, (Ireland,) Petitions from Ballinrobe & Paradise St. Chapel, Liverpool, in favor of proposed Plan. Outrages, (Ireland,) Returns of, Ordered. Hunter v. Lawrence et al. Trade & Agriculture, Monetary System, &c. Petition from York respecting. 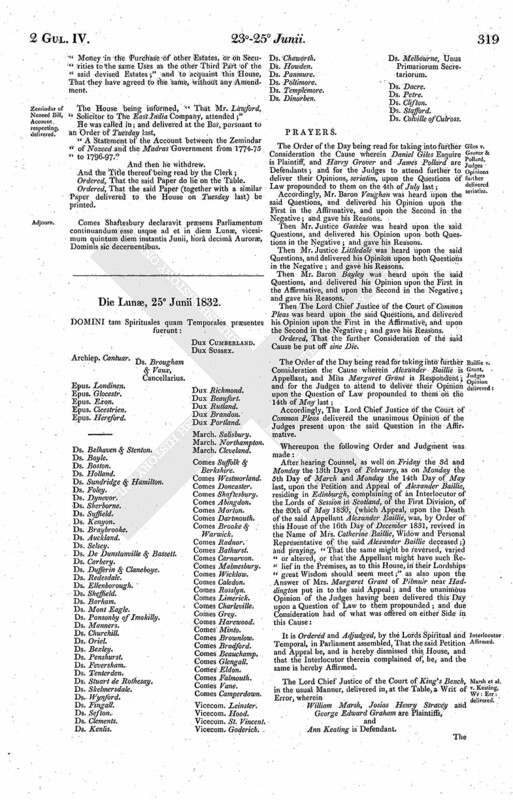 Petition of G. W. Busteed for Relief. Message to H.C. for Report on Steam Carriages. Divisions of Counties Bill, Petition from Bewdley against being joined with Lower Mitton with Lickhill in the Elective Franchise. London & Birmingham Railway Bill, Petition against, referred to the Com ee. Members (H.C.) Seats Vacating Bill. Standing Order, No. 153, amended. Accordingly, Mr. Baron Vaughan was heard upon the said Questions, and delivered his Opinion upon the First in the Affirmative, and upon the Second in the Negative; and gave his Reasons. Then Mr. Justice Gaselee was heard upon the said Questions, and delivered his Opinion upon both Questions in the Negative; and gave his Reasons. Then Mr. Justice Littledale was heard upon the said Questions, and delivered his Opinion upon both Questions in the Negative; and gave his Reasons. Then Mr. Baron Bayley was heard upon the said Questions, and delivered his Opinion upon the First in the Affirmative, and upon the Second in the Negative; and gave his Reasons. Then The Lord Chief Justice of the Court of Common Pleas was heard upon the said Questions, and delivered his Opinion upon the First in the Affirmative, and upon the Second in the Negative; and gave his Reasons. Accordingly, The Lord Chief Justice of the Court of Common Pleas delivered the unanimous Opinion of the Judges present upon the said Question in the Affirmative. It is Ordered and Adjudged, by the Lords Spiritual and Temporal, in Parliament assembled, That the said Petition and Appeal be, and is hereby dismissed this House, and that the Interlocutor therein complained of, be, and the same is hereby Affirmed. William Marsh, Josias Henry Stracey and George Edward Graham are Plaintiffs, and Ann Keating is Defendant. The Counsel for the Defendant in Error was, in Part, heard. Ordered, That the further Consideration of the said Cause be put off to Wednesday next; and that the Judges do then attend. Ordered, That the Errors assigned upon the Writ of Error wherein John Doe, on the Demise of Isaac Winter, is Plaintiff, and Matthew Perratt and William Burge are Defendants, be argued by Counsel at the Bar on Wednesday next; and that the Judges do then attend. Mr. Serjeant Taddy stated, "That he proposed to close his Case here, not feeling it to be necessary to adduce further Evidence: That the Petitioner had been in Attendance each Day on which the Case had been appointed to proceed, in obedience to their Lordships Order, but that she was now in a State of Health rendering her unable to attend: That a Medical Man was in Attendance, who would state that it was real and serious Indisposition which prevented her Attendance." Ordered, That the further Consideration and Second Reading of the said Bill be put off sine Die. Ordered, That the Evidence taken on the said Bill be printed. 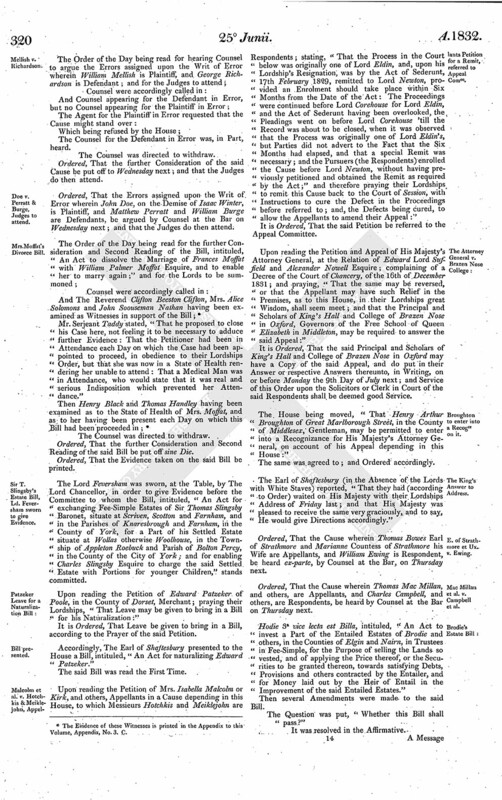 The Lord Feversham was sworn, at the Table, by The Lord Chancellor, in order to give Evidence before the Committee to whom the Bill, intituled, "An Act for exchanging Fee-Simple Estates of Sir Thomas Slingsby Baronet, situate at Scriven, Scotton and Farnham, and in the Parishes of Knaresbrough and Farnham, in the County of York, for a Part of his Settled Estate situate at Wollas otherwise Woolhouse, in the Township of Appleton Roebuck and Parish of Bolton Percy, in the County of the City of York; and for enabling Charles Slingsby Esquire to charge the said Settled Estate with Portions for younger Children," stands committed. Upon reading the Petition of Edward Patzeker of Poole, in the County of Dorset, Merchant; praying their Lordships, "That Leave may be given to bring in a Bill for his Naturalization:"
Accordingly, The Earl of Shaftesbury presented to the House a Bill, intituled, "An Act for naturalizing Edward Patzeker." Upon reading the Petition of Mrs. Isabella Malcolm or Kirk, and others, Appellants in a Cause depending in this House, to which Messieurs Hotchkis and Meiklejohn are Respondents; stating, "That the Process in the Court below was originally one of Lord Eldin, and, upon his Lordship's Resignation, was by the Act of Sederunt, 17th February 1829, remitted to Lord Newton, provided an Enrolment should take place within Six Months from the Date of the Act: The Proceedings were continued before Lord Corehouse for Lord Eldin, and the Act of Sederunt having been overlooked, the Pleadings went on before Lord Corehouse 'till the Record was about to be closed, when it was observed that the Process was originally one of Lord Eldin's, but Parties did not advert to the Fact that the Six Months had elapsed, and that a special Remit was necessary; and the Pursuers (the Respondents) enrolled the Cause before Lord Newton, without having previously petitioned and obtained the Remit as required by the Act;" and therefore praying their Lordships to remit this Cause back to the Court of Session, with Instructions to cure the Defect in the Proceedings before referred to; and, the Defects being cured, to allow the Appellants to amend their Appeal:"
Upon reading the Petition and Appeal of His Majesty's Attorney General, at the Relation of Edward Lord Suffield and Alexander Nowell Esquire; complaining of a Decree of the Court of Chancery, of the 16th of December 1831; and praying, "That the same may be reversed, or that the Appellant may have such Relief in the Premises, as to this House, in their Lordships great Wisdom, shall seem meet; and that the Principal and Scholars of King's Hall and College of Brazen Nose in Oxford, Governors of the Free School of Queen Elizabeth in Middleton, may be required to answer the said Appeal:"
It is Ordered, That the said Principal and Scholars of King's Hall and College of Brazen Nose in Oxford may have a Copy of the said Appeal, and do put in their Answer or respective Answers thereunto, in Writing, on or before Monday the 9th Day of July next; and Service of this Order upon the Solicitors or Clerk in Court of the said Respondents shall be deemed good Service. The House being moved, "That Henry Arthur Broughton of Great Marlborough Street, in the County of Middlesex, Gentleman, may be permitted to enter into a Recognizance for His Majesty's Attorney General, on account of his Appeal depending in this House:"
Ordered, That the Cause wherein Thomas Bowes Earl of Strathmore and Marianne Countess of Strathmore his Wife are Appellants, and William Ewing is Respondent, be heard ex-parte, by Counsel at the Bar, on Thursday next. Ordered, That the Cause wherein Thomas Mac Millan, and others, are Appellants, and Charles Campbell, and others, are Respondents, be heard by Counsel at the Bar on Thursday next. Hodie 3a vice lecta est Billa, intituled, "An Act to invest a Part of the Entailed Estates of Brodie and others, in the Counties of Elgin and Nairn, in Trustees in Fee-Simple, for the Purpose of selling the Lands so vested, and of applying the Price thereof, or the Securities to be granted thereon, towards satisfying Debts, Provisions and others contracted by the Entailer, and for Money laid out by the Heir of Entail in the Improvement of the said Entailed Estates." With a Bill, intituled, "An Act to amend and enlarge the Powers of an Act for establishing Portman Market, within the County of Middlesex;" to which they desire the Concurrence of this House. To return the Bill, intituled, "An Act for empowering the Trustees of the Blue Coat Charity School in Warrington, in the County of Lancaster, to make Sales and to grant Building and Mining Leases of certain Parts of the Estates belonging to the said Charity; and for other Purposes therein mentioned;" and to acquaint this House, That they have agreed to the same, without any Amendment. To return the Bill, intituled, "An Act for establishing and carrying into Effect an Agreement for a Partition between William Henry Bowen Jordan Wilson Esquire and Edmund Meysey Wigley Greswolde Esquire, of Estates in the County of Warwick;" and to acquaint this House, That they have agreed to the same, without any Amendment. To return the Bill, intituled, "An Act for effectually settling all the Estates in Great Britain which by the Will of the late Right Honorable George Pitt Lord Rivers deceased, dated the Fifteenth of March One thousand eight hundred and twenty-three, are required to be settled by The Right Honorable George Pitt Rivers now Lord Rivers to the Uses directed by such Will;" and to acquaint this House, That they have agreed to the same, without any Amendment. 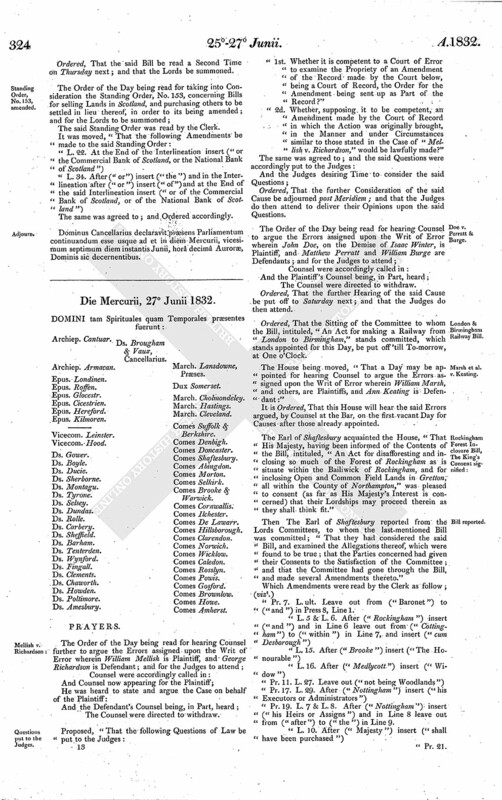 Upon reading the Petition of the Inhabitants of the Parish of Ballinrobe, in the County of Mayo, whose Names are thereunto subscribed; praying, "That their Lordships will continue the present System of Irish National Education sanctioned by the Government of the Country:"
Upon reading the Petition of the Members of the Society of Protestant Dissenters assembling for Worship in Paradise Street Chapel, Liverpool, whose Names are thereunto subscribed; praying, "That their Lordships will give to the Scheme proposed by His Majesty's Government for securing the Benefits of Education to the Children of the whole Irish People, upon a combined System of Instruction, without Distinction of Religious Denominations, the Sanction of their Approval:"
The Earl of Shaftesbury reported from the Lords Committees, to whom the Bill, intituled, "An Act for erecting and maintaining a new Court House and Public Offices for the County of Inverness," was committed; "That they had considered the said Bill, and examined the Allegations thereof, which were found to be true; and that the Committee had gone through the the Bill, and directed him to report the same to the House, without any Amendment." Ordered, That there be laid before this House, "A Copy of the Monthly Returns of the Chief Constables of Police in Ireland, of the King's County, Queen's County, Westmeath, Carlow, Kilkenny, Clare and Tipperary, of Outrages committed in their respective Baronies, and furnished by them to the Inspectors General of Police, and by them forwarded to the Government, from the 1st of March to the latest Period." Upon reading the Petition of the Wholesale Grocers residing in the Town of Sunderland, in the County of Durham, whose Names are thereunto subscribed; taking notice of a Bill depending in this House, intituled, "An Act for making and maintaining a Wet Dock on the North Side of the River Wear, at or near the Entrance of the Port of Sunderland, in the County Palatine of Durham;" and praying their Lordships "to relieve them from the Tax, for the Support and Erection of the said Dock, on all Goods, Wares and Merchandizes entering the Port of Sunderland, whether entering the Dock or not; a Tax at once unprecedented and unjust, and at variance with every Principle of Reason and of Equity; and that the said Bill may not pass into a Law as it now stands, but that the Petitioners may be heard by their Counsel, Agents and Witnesses against such Parts of the said Bill as may affect them:"
Upon reading the Petition of the Persons whose Names are thereunto subscribed, carrying on extensive Business at the Port of Sunderland, in the County of Durham, as Ship Builders, Iron Founders, and Manufacturers of Earthenware, Glass, Anchors, Chains, Cordage, &c. taking notice of the last-mentioned Bill, and praying their Lordships, "That the same may not pass into a Law as it now stands, but that the Petitioners may be heard by their Counsel, Agents and Witnesses against such Parts of the said Bill as may affect them:"
Upon reading the Petition of Nicholas Corner Reed, a Ship Owner of the Port of Sunderland, and an Owner of Property there; taking notice of the last-mentioned Bill, and praying their Lordships, "That the same may not pass into a Law, and that he may be heard in the Premises by his Counsel, Attornies, Agents and Witnesses:"
It is Ordered, That the said Petition be referred to the Committee to whom the said Bill stands committed, and that the Petitioner be at liberty to be heard by his Counsel, Attornies, Agents and Witnesses, as desired. Hodie 2a vice lecta est Billa, intituled, "An Act to explain and render effectual the Provisions of an Act, intituled, "An Act to permit the general Sale of Beer and Cyder by Retail in England." Ordered, That there be laid before this House, Copies of the Title Pages of the Books called by the Board of Education in Ireland "The Standards of the Roman Catholic Church," and a Statement of the Authority on which they are so called by the Board, particularly whether that Authority be the Roman Catholic Members of the Board, or any other:"
And also, "A Statement of the "Alterations required by the Board" in any "School Books issued by the Roman Catholic Society which have received the Sanction of the Board," and of the Measures taken to ensure that these Alterations be made before such Books be used in any of the Schools in behalf of which Applications for the Aid of the Board have been complied with." Ordered, That there be laid before this House, "A Statement of the Nature and Extent of the Aid required in each of the several Applications complied with by the Board of Education in Ireland; and a Statement of the Precautions taken by the Board to secure the Expenditure of the Grants for the Purposes for which they were made:"
Also, "The Names and Religious Profession of the Masters, Assistant Masters, and Mistresses of the several Schools which have received such Aid:"
Also, "The Name or Names, Address, and Religious Profession of the Individual or Individuals under whose Direction the several Schools which have received such Aid are respectively placed:"
Also, "In all Cases of Applications which have been complied with, of the First Class, ("signed by Clergy of both Persuasions,") the Names of the said Clergy, the Religious Denomination of each of the Protestant Clergy, and their Connection with the Parish in which the Schools for which they apply are situated:- In all Cases of the Second Class, ("signed by Clergy of one Persuasion and Laity of another,") the Name and Religious Profession of the Clergymen so signing, and their Connection with the Parishes for which they apply, and the Number of the Lay Applicants:-In all Cases of the Third Class, ("signed by Laity of both Persuasions,") the Number of the Applicants, Protestant and Roman Catholic, and the several Religious Denominations, if known, of the Protestants:"
Also, "In all Cases of Applications for existing Schools which have been complied with, the Numbers, severally, of Protestant and Roman Catholic Children in Attendance:"
And also, "The Names, Religious Profession, and Amount of Salary of the Inspectors appointed by the Board, and the Instructions given to them." Upon reading the Petition and Appeal of John Hunter, Writer to the Signet, residing in Edinburgh; complaining of an Interlocutor of the Lord Ordinary in Scotland, of 2d February 1832, in so far as his Lordship "Finds, in the Circumstances of the Case as admitted by the Petitioner, that the Petitioner is not entitled to the Privileges of a bonâ fide and onerous Indorsee;" and also of Three Interlocutors of the Lords of Session there, of the First Division, of the 24th Day of May and 1st and 16th Days of June 1832; and praying, "That the same may be reversed, varied or altered, or that the Appellant may have such Relief in the Premises, as to this House, in their Lordships great Wisdom, shall seem meet; and that Isobel Lawrence or George, Relict of the deceased James George, sometime Innkeeper in Huntly; James Allardes Esquire, of Cobairdy; George Gordon, residing in Huntly; Thomas Johnston, Banker in Keith; and Andrew Dun, Writer to the Signet, may be required to answer the said Appeal:"
It is Ordered, That the said Isobel Lawrence or George, and the several other Persons last named, may have a Copy of the said Appeal, and do put in their Answer or respective Answers thereunto, in Writing, on or before Monday the 23d Day of July next; and Service of this Order upon the said Respondents, or upon any one of their known Agents in the Court of Session in Scotland, shall be deemed good Service. 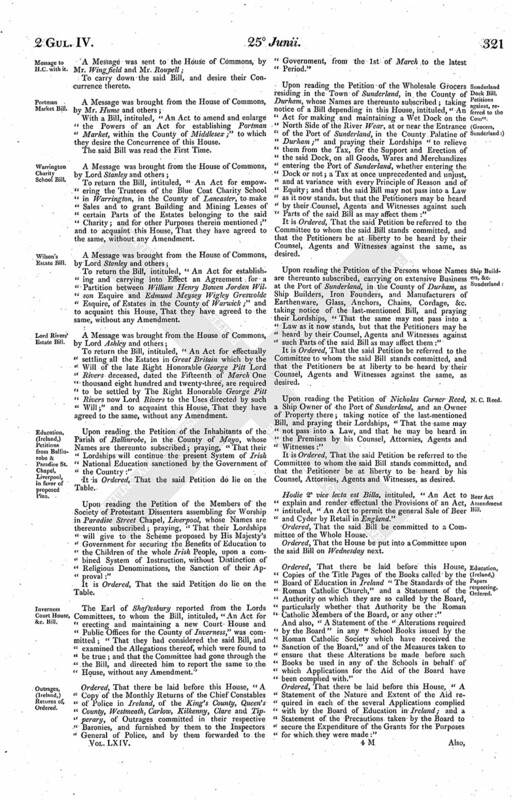 Upon reading the Petition of the Proprietors and Occupiers of Land of the City and Vicinity of York, whose Names are thereunto subscribed; complaining of the distressed State of Trade and Agriculture throughout the Kingdom, and praying their Lordships "to devise Means by which a secure Monetary System may be established, whereby Credit and Confidence may be restored, and the Energies of the Productive Classes may be raised from a State of Lethargy and Inactivity to one of Healthfulness and Vigour; that Property may be made the Basis of Taxation, and that the Burthen may be removed from the Shoulders of the Working Classes by a well-defined and graduated Tax upon Property of every Denomination; and that their Lordships will discountenance that System falsely called "Free Trade," from the Introduction of which may be dated a very considerable Proportion of the Evils which have depressed many of the most important Interests of the State:"
Upon reading the Petition of the Inhabitants of the Borough of Reading and its Vicinity, whose Names are thereunto subscribed; praying their Lordships "to take the Criminal Laws into their Consideration, for the Purpose of the Revision and Amendment of the same, by drawing a Distinction between the simple Invasion of the Rights of Property, and Crimes of Violence and Blood, and by abolishing the Penalty of Death in all Cases in which the Legislative Power cannot justify in the Eyes of God and Man that last and dreadful Alternative, the Extermination of the Offender:"
Upon reading the Petition of the Inhabitants of Horsham and its Neighbourhood, in the County of Sussex, whose Names are thereunto subscribed; praying their Lordships "to take the present State of the Penal Laws into their Consideration, for the Purpose of revising and amending the same, in order that the dreadful Punishment of Death may no longer be inflicted for Offences committed against Property unattended with personal Violence:"
Upon reading the Petition of the Magistrates, Clergymen, Merchants, Bankers and other Inhabitants of Liverpool and its Vicinity, in the County of Lancaster, whose Names are thereunto subscribed; praying their Lordships, "That the Penal Laws relating to Property may be amended by the Commutation in all Cases of the Punishment of Death:"
And also, Upon reading the Petition of the Inhabitants of the Parish of Danby, in the County of York, whose Names are thereunto subscribed; severally praying their Lordships "for a Revision of the Criminal Code, and the Abolition of the Punishment of Death for Offences against Property:"
Upon reading the Petition of the Inhabitants of the Parish of Stapleton, in the County of Cumberland, and its Vicinity, whose Names are thereunto subscribed; praying their Lordships "to abolish the Punishment of Death in all Cases of Offences against Property, and to substitute in its Stead Penalties more agreeable to the Nature of such Offences:"
Upon reading the Petition of the Inhabitants of the Parish of Culmstock, in the County of Devon, whose Names are thereunto subscribed; praying their Lordships "to repeal those Laws which decree the Forfeiture of Human Life for Crimes against Property, substituting such Modes of Punishment, according to the Nature of the Offence, as would be sure and prompt in their Execution, and more powerful in deterring the evil-disposed:"
Upon reading the Petition of the Inhabitants of the Borough of Truro and of the Parishes adjacent, whose Names are thereunto subscribed; praying their Lordships "to repeal all those Laws which attach the Punishment of Death to Offences against Property, and to substitute a Punishment better proportioned to the Degree of Crime, better adapted to accomplish its true Object, and better calculated to promote the Interests of Society:"
Upon reading the Petition of the Inhabitants of the Town and Neighbourhood of Kingston upon Thames, in the County of Surrey, whose Names are thereunto subscribed; praying their Lordships "to repeal those Laws which affix the Penalty of Death to Crimes against Property, and to substitute others better calculated to promote the Interests of Society, and more consonant to the Spirit of the Christian Religion:"
Upon reading the Petition of the Inhabitants of Olney, whose Names are thereunto subscribed; praying their Lordships "to take the Penal Laws into Consideration, with a view to the Commutation of the Punishment of Death for Crimes against Property unattended with personal Violence:"
Upon reading the Petition of the Inhabitants of Beverley, in the County of York, and the Neighbourhood, whose Names are thereunto subscribed; praying their Lordships "to substitute other Laws more equitable and efficacious against the Violations of the Rights of Property, instead of those which enact the Forfeiture of Human Life:"
Upon reading the Petition of George Washington Busteed, complaining of his Suspension from the Situation of Chief Secretary to the Government of the Island of Saint Lucia; and praying their Lordships "for that which every Subject has a Right to expect, a Knowledge of the Crimes imputed to him, an impartial Trial, and Justice, or such other Interference and Redress as to their Lordships may seem fit to afford:"
The House being informed, "That the Respondent's Agent in the Cause Gardiner against Simmons attended, in order to deliver in his Bill of Costs, pursuant to the Order of the House of Thursday last;"
It is Ordered and Adjudged, by the Lords Spiritual and Temporal, in Parliament assembled, That the said Petition and Appeal be, and is hereby dismissed this House: And it is further Ordered, That the Appellant do pay or cause to be paid to the said Respondent the Sum of One hundred Pounds, for his Costs in respect of the said Appeal. Ordered, That the Bill, intituled, "An Act to regulate for Five Years Road Tolls on Steam Carriages," be read a Second Time on Wednesday next. Ordered, That a Message be sent to the House of Commons, to request that they will be pleased to communicate to this House a Copy of a Report made from the Select Committee appointed by that House in the last Session of Parliament on Steam Carriages, together with the Minutes of Evidence taken before the Committee, and the Appendix. 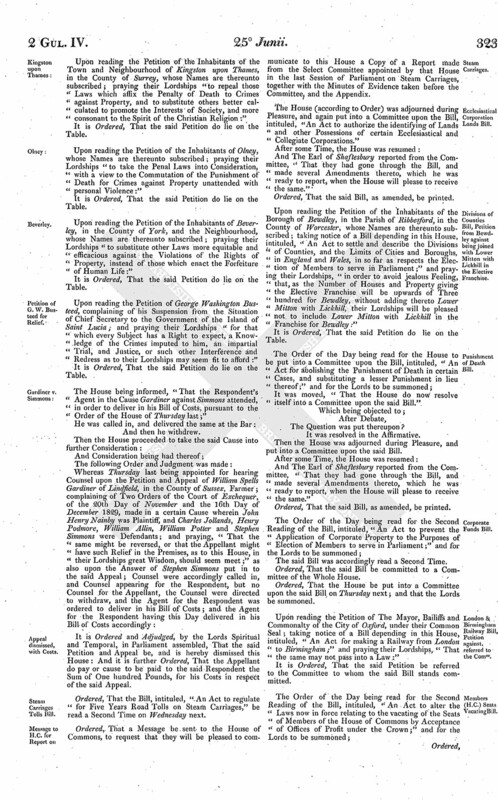 Upon reading the Petition of the Inhabitants of the Borough of Bewdley, in the Parish of Ribbesford, in the County of Worcester, whose Names are thereunto subscribed; taking notice of a Bill depending in this House, intituled, "An Act to settle and describe the Divisions of Counties, and the Limits of Cities and Boroughs, in England and Wales, in so far as respects the Election of Members to serve in Parliament;" and praying their Lordships, "in order to avoid jealous Feeling, that, as the Number of Houses and Property giving the Elective Franchise will be upwards of Three hundred for Bewdley, without adding thereto Lower Mitton with Lickhill, their Lordships will be pleased not to include Lower Mitton with Lickhill in the Franchise for Bewdley:"
It was moved, "That the House do now resolve itself into a Committee upon the said Bill." Ordered, That the House be put into a Committee upon the said Bill on Thursday next; and that the Lords be summoned. Upon reading the Petition of The Mayor, Bailiffs and Commonalty of the City of Oxford, under their Common Seal; taking notice of a Bill depending in this House, intituled, "An Act for making a Railway from London to Birmingham;" and praying their Lordships, "That the same may not pass into a Law:"
The said Standing Order was read by the Clerk. Dominus Cancellarius declaravit præsens Parliamentum continuandum esse usque ad et in diem Mercurii, vicesimum septimum diem instantis Junii, horâ decimâ Auroræ, Dominis sic decernentibus.